Can I view websites on an iPad in an iPhone sized window? I'm trying to test out how my website looks on the iPhone, but all I have is an iPad. Is there a way to force the iPad into iPhone size view window? Well, you could find a third-party browser app that is only for the iPhone and use that on your iPad. There are plenty of free ones. Just search for "browser" in the App Store. Nope, you can't do that. But if you have a Mac, you can install Xcode from the Mac App Store for free. It comes with an app called iOS Simulator which will let you run Mobile Safari on your Mac, including the resolution of older iPhones/iPods (non-retina display), new retina display iPhones, and the iPad's resolution. I'm not aware of any way to properly test your website on Windows or Linux, changing the browser window size is not good enough. More or less any browser which has a special iPhone version (not universal) will work. I recommend the Perfect Browser, or Aquari iPhone browser. If you can use a desktop version of Google Chrome, it can emulate an iPhone. In the debug mode, click the "emulate devices" icon near of top left of the debug panel, and it can let you emulate iPhones, iPad, Samsung phones, and many other models (the list is about 20 items long). 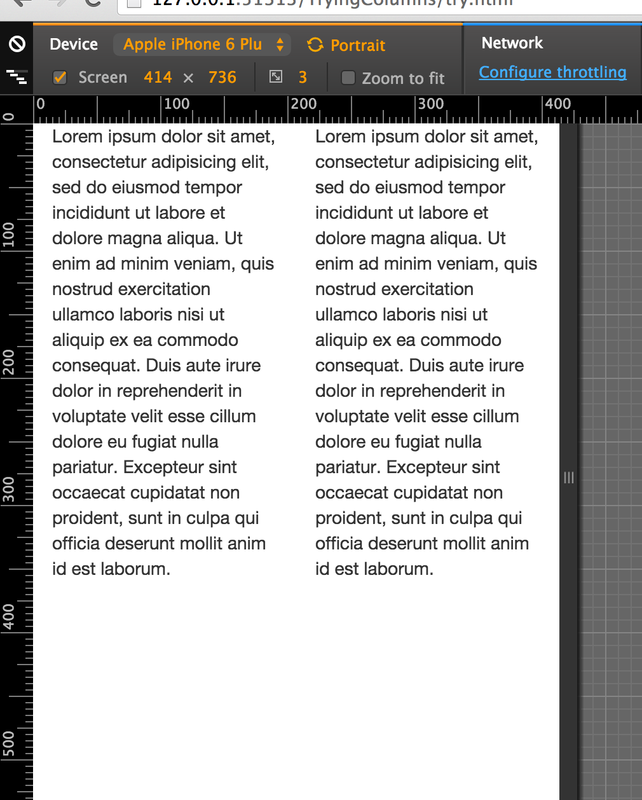 Then the emulator for iPhone 6 Plus will show a "yes I am a small screen and I will act accordingly" version of the page. On the other hand, without the above line, iPhone 6 Plus will pretend itself to be a powerful browser with a wide screen, and show you the page -- but in this case the text will be very small and not very readable. So what I mean is, Google Chrome will emulate your phone with the HTML code being displayed faithfully, as if it is a real device. Compare that with Firefox version 44.0, which can only emulate the device size, but it won't care about the meta line above, so you could see one version of the page on Firefox, and see a different version of the page on a real device. Not the answer you're looking for? Browse other questions tagged iphone ipad web-browsing display . How do I view an SSL certificate on my iPad from Safari? Which photo websites have iPad support for editing and ordering prints, cards and books? Can you restore deleted messages on iPhone 6 from iPad?